Cold Granite is the first book in the DS Logan McRae series and it is a belter! 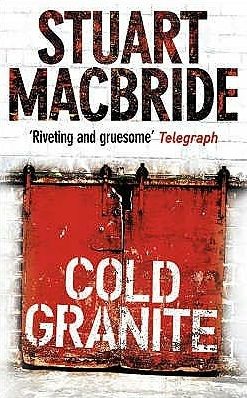 I am a fan of Stuart MacBride and cannot believe that I don’t have a review of Cold Granite on here! It was only when I was reviewing another fabulous Scottish crime debut that I realised and so I’ve quickly put together a review as Cold Granite is a brilliant book and the DS Logan McRae series is not to be missed. I was first introduced to the book on a flight home from New York when the person to my left was chuckling to themselves while reading it. When I got a chance to glance at the cover it didn’t strike me as looking like a particularly amusing book but once I secured a copy and sat down to read it for myself I soon discovered that the story is full of humorous touches and one liners; welcome relief from the stark gruesomeness of the tale itself. Logan ‘Laz’ is brilliant character, he puts me in mind of Gary Goodhew from the Cambridge Blue books, his personality is perfect for the role and he bounces off of his quirky superiors in a delightful manner. It is the wonderful DI Steel who brings much of the humour to the book, she is fabulous to read. Then there is DI Insch who bears the brunt of many an eloquently penned joke. Both are great. The Aberdeen described in Cold Granite is not one that I would imagine the tourist board appreciating! It sounds like hell on earth but the descriptive writting required to bring about this assault to the senses is quite flawless. If you like crime books, you must read Cold Granite. It’s DS Logan McRae’s first day back on the job after a year off on the sick, and it couldn’t get much worse. Three-year-old David Reid’s body is discovered in a ditch, strangled, mutilated and a long time dead. And he’s only the first. There’s a serial killer stalking the Granite City and the local media are baying for blood.